On this date in 1783, highwayman John Austin was hanged at Tyburn for robbing and murdering John Spicer on the road to London. 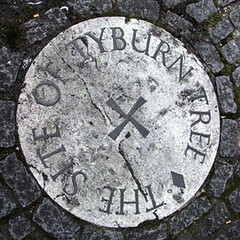 The village Tyburn on the outskirts of London had been used for public hangings dating to the 12th century. Though not the only site of executions in London, it was the iconic one. Situated at the modern intersection of Edgware and Bayswater Roads on the northeast corner of Hyde Park, the distinctive “Tyburn tree” — a triangular gallows capable of hanging over twenty prisoners simultaneously — made a foreboding landmark round which teemed thousands of spectators on execution days. Some 1,200 people were executed on this singular device. Public executions typically began four kilometers away at Newgate Prison, where the condemned were loaded into ox carts for a two-to-three-hour procession through public streets now at the very core of London, perhaps including stops at public ale houses. Even that formative age was receding. Once a neighboring village, Tyburn had been swallowed up by the city; a generation before Austin’s death, residents of the now-upscale neighborhood had successfully pushed for the removal of the macabre “Tyburn tree”. Austin was hanged, instead, on a portable gallows, a typical penitent imploring heavenly mercy and taking 10 minutes to strangle to death — the very last execution at that somber and storied crossroads.